My two worst races in 2016 have been the two biggest. First, the world half marathon championships in Cardiff, which I entered a year in advance. Second, the British and Irish Masters International, which I was selected to compete in just three weeks before it took place. In both cases catching a cold before the event blunted my performance. I struggled round the streets of Cardiff in atrocious conditions, finishing over three minutes down on the time I’d hoped and trained for. The half marathon is a tough event and I can still remember the mounting pain I felt as I slogged through Roath with rain slicing across me. Happily, though, I’d let noone down but myself. In Glasgow things were rather different. 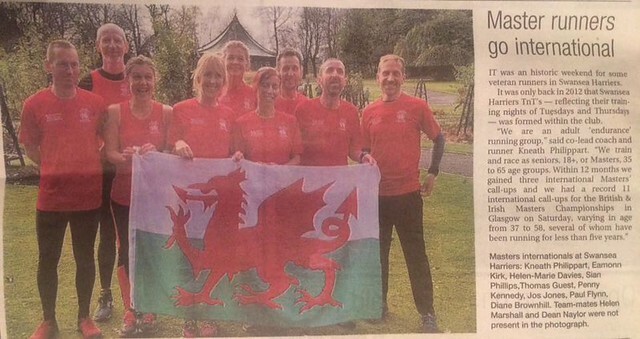 I had been selected for the Welsh team. It was a full weekend, involving flights, a hotel, dinner, an awards ceremony. I arrived at the hotel late on the Friday night to find some of the senior team members in the foyer nursing half pints and soft drinks. They were talking about how much slower runners were these days, apparently a discussion they have every year. Bernie Jones, the team manager, went to collect the vest I’d ordered in advance. Unfortunately the small vests had been taken and the best he could do was a medium which came mid-way down my thighs. Saturday, race day. 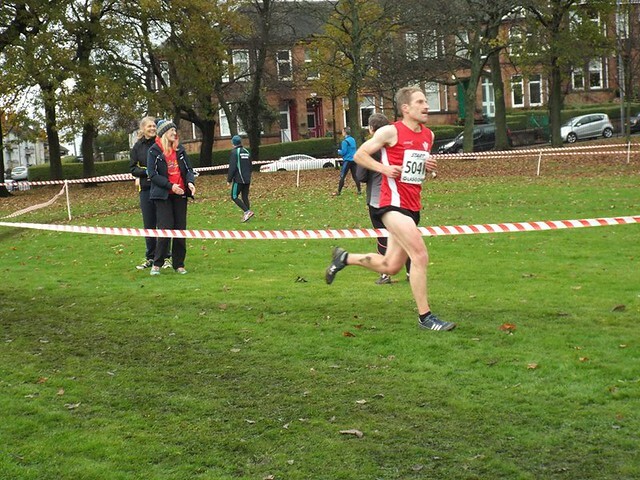 I liked the look of the course: a grassy, undulating loop of Tolcross Park, soft in places but no standing water. There were team photographs by the rose garden. I warmed up, puffing and blowing, missing the usual spring in my legs. Eamonn had lent me one of his old vests, a small, so I at least looked the part. I didn’t go out hard. For the first two laps I ran with Royston Whitehouse and Alan Davies, two runners who I’d taken a minute out of at Bridgend. Then I faded badly. I felt like I couldn’t breathe. I had to rein my effort in and suffered the indignity of being an easy target for runners who had paced themselves better. The worst of it is that if it weren’t for the cold, I was in great form. Oh, I’m under no illusions, I was never going to challenge the leaders in my category, but I could at least have run to my full ability and scored for my team. Watching the V35-V50 race was a true education: I have never seen such fast cross country running. The Irish team smashed the course, tailing an unfortunate English hare for three high speed laps then flying round the final lap at full tilt to take the top three spots.